A regular use of flow cytometers is the determination of the density of specific molecules on the surface of one or more cells in a population. These measurements may be relative, semiquantitative, or quantitative depending upon the question asked and the reagents available. In most cases, the measurement of "relative fluorescence intensity" is adequate, where the fluorescent channel number that best approximates the average fluorescence of one population is compared with the same value from a second population labeled with the same reagent. The only difficulty with such a comparison is determining the average level of fluorescence. In most cases, when fluorescent signals derived from mAb binding are measured, the data are log-transformed to provide sufficient resolution of the cells. This means that the distributions, although appearing Gaussian, are actually "log normal" distributions in which the mean fluorescence intensity will be skewed to the right; that is, the mean will overestimate the true average fluorescence intensity. The best estimate of the average of log-arrayed fluorescent signals is the median or geometric mean, so always assess "median fluorescence intensity" rather than mean. Median fluorescence intensity is a value that should be taken from a single log-normal distribution. Taking a single median value from a fluorescence signal that contains multiple log-normal distributions should be avoided (e.g., the PI signal in Figure 3A, which shows at least three subpopulations). Plainly, the NK cells have shown considerably greater activation in response to the tumor cell lysate than the T cells and the relative fluorescence intensities of the two populations can be compared with each other or with their nonstim-ulated state. 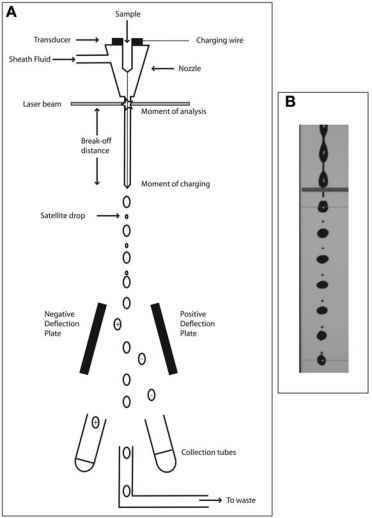 A bead preparation containing unlabeled beads plus seven bead populations expressing increasing amounts of fluorochrome was analyzed by flow cyto-metry, and the resultant fluorescent peaks were arrayed as log-amplified data (Fig. 5A). Fig. 4. Histograms A and B show the background expression of CD69 on NK and T cells, respectively, incubated in the absence of the tumor cell lysate. Histograms C and D show the effect of stimulation with the tumor cell lysate on the same cells. Fig. 5. (A) Multiparameter fluorescent beads are analyzed with logarithmic acquisition and linear data array. (B) The correlation between median channel linear data array of logarithmically amplified fluorescence and molecules of soluble fluorochrome/bead as defined by the manufacturer. The median channel fluorescence of each fluorescent peak (not the unlabeled beads) was determined and plotted against the stated fluorescence intensity of each bead population as given by the manufacturers on a log-log display (Fig. 5B). The median channel fluorescence value of a cell population can be resolved to a standardized fluorescence intensity by interpolation onto this straight line. It must be noted that the values used for fluorescence intensity are not standardized between manufacturers, so this is not a quantitative value in the true sense of the word. An alternative approach that is closer to absolute quantitation of binding sites for individual mAbs is use of the so-called "antigen-binding capacity" (or ABC) beads. These are available from at least two different manufacturers and are based on the provision of beads that are coated with known numbers of molecules of antibody to murine immunoglobulin Fc. 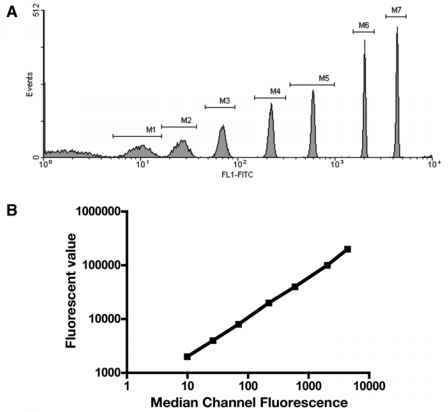 By incubating beads with the fluorochrome-conjugated antibody of choice, the median channel fluorescence value associated with a specific number of molecules of bound mAb can be determined using a plot similar to the one shown above (Fig. 5). This statement has at least two caveats, however. First, the beads measure binding of the mAb of interest via its Fc, which is determined by the affinity of the anti-Fc mAb on the beads. In contrast, experimentally, the binding of the mAb of interest to the cells of interest is determined by the affinity of the mAb of interest for its specific antigen. Second, it is assumed that the mAb of interest can bind its specific antigen in a monovalent fashion only and this is by no means certain unless a monovalent antibody can be purchased. Nonetheless, such beads have been used to semiquantitate the expression of specific antigens on the surface of leukemic cells at the time of disease presentation and to then demonstrate that the level of expression of these antigens is specific to the malignant clone when compared with normal immature bone marrow mononuclear cells that arise in patients after chemotherapy (3). How to standardize mean fluorescence intensity measurements? How to determine mean fluorescene intensity? How to calculate the relative fluorescence intensity? How to measure fluorescence intensity? How to represent flow cytometry intensity histogram in terms of % maximum? How to find mean fluorescence intesity? How to measure fluorescence intensity using flow cytometry?